Cleaning glass windows properly without leaving any streaks can be a tedious task. If you want it looking sparkling new, our experts can help. Whether you need a one-off residential window cleaning service or want us to clean your windows regularly, Shazam Window Cleaning can easily make them look beautiful at an affordable price. No more stressing and wondering, how do I clean windows? 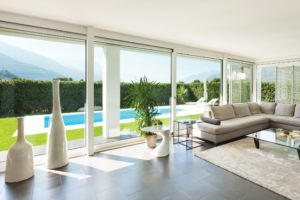 You’ll be amazed at how stunning your clean windows can make your home look and how much more vibrant your garden will appear from inside once we wash the fingerprints, dust and stubborn sprinkler water spots off your windows! With our help, you’ll enjoy looking at our beautiful country through crystal-clear windows. The sunlight shining through will brighten up your home and your day! If you’ve been putting off hiring a professional window cleaner because you thought you couldn’t afford to do it, then you’re in luck! We’ve made our window washing services so affordable you’ll be able to get your windows washed every 3 to 6 months. We also promise to show up on time, every time. And unless the job changes, we promise to stick with our original quote. Wherever you have glass windows and any other delicate glass surfaces, we have the skills and equipment to reach them and wash them well. This includes atriums, glass balconies and glass pool fences. We only use eco-friendly cleaning products and advanced glass cleaning technology that cleans without scratching the glass or leaving behind any ugly marks or chemical residues. Our staff are fully vetted, they’re trained to safely deliver an exceptional residential window cleaning service and solar panel cleaning service that will exceed your expectation. You can also rest assured that they’ll practise safe cleaning techniques as per the industry standards. They use a unique water fed pole system that guarantees their safety and protects your property. This technology makes it possible to reach windows in your home with the option of not using any ladders, scaffolding or lifts. You may read their testimonials here. Our goal at Shazam Window Cleaning is to keep you happy so you stay with us for life! We go above and beyond to guarantee that you’ll love the efficiency and quality of our work, every time. If you needed a clean house or other property cleaned yesterday, call us and say: “I need it cleaned, pronto”. We’ll book it into our next available slot right away and you’ll soon have shiny windows. Ready to experience our superior window washing services?